In reality we are heading into a mini ice age , all related to the SUN and it's activities it's in a cooling phase for a while now , and climate has been changing since the beginning of the earth NOTHING new and it will continue to change . Notice how they originally called it global warming that didn't pan out so they re named it pathetic . Heat rises! The greenhouse effect is impossible! How can it warm the earth? #GlobalWarning! Journalist gets it handed to him. Toughest argument I've heard against climate change is "it's just weather cycles". I have yet to see any countering data that can be reproduced. Too many (probably on both sides, actually) seem to either gloss over, or completely ignore, the scale of things and oversimplify the arguments. 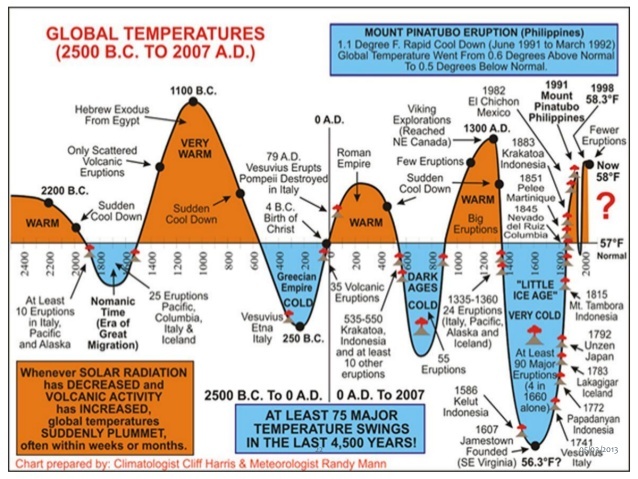 Yeah, the climate is always changing, but the cycles take thousands of years to come back around. Human beings have had a measurable impact on the proportion of chemicals in the air, soil, and sea. Of course the proportion changes are small and, to some, arguably negligible, but they are still impactful. Imagine taking a tenth of a milligram of poison in the morning before heading out for the day… every day–who can say what the true impact will be? Maybe not enough to even notice, short term. But to say it does nothing, and to continue anyway… I'll be nice and just say it's probably not the best route to take when there are clearly so many better ones. The failure of deniers comes from a few places. One is that they generally believe that scientists worldwide are in it for the money or are somehow in league with each other for some kind of gain. Clearly ridiculous, but falls in line with denying the validity of large data sets showing evidence of opposite notions–the two-point data trend of deniers. Another failure is the failure to acknowledge the measurable and available data as relevant to the existence of human environmental impact. Climate change or not, the data is there, and the arguments that support climate change ought to be examined. Anybody with links to the southern hemisphere weather chilling, contrasting the north warming? Climate change is a hoax.brain dead host told what to say and think by his media company.earth came through millions of years of volcanic activity,storms,earthquakes,iceages.etc,and the planet is still here and will be still here billions of years after humans are gone. God doesn't make mistakes that's how i know it's a hoax. They are a gravy train, all corruption. When a crazy person talks that way you know they're telling the truth. This guy knows things. Every hot day during the summer and every natural disaster will be attributed to "climate change" by those who want the sort of policies associated with the political and economic agenda that the "climate change" agenda represents. There is no greater prevalence or severity of natural disasters in the modern era either. The climate change agenda is a fraud agenda. Maybe climate is changing and it's not due to pollution and they want to keep the public in the dark. If hes telling lies why doesnt this on national news around the world?? the governments paying for the grants to study climate change will only fund scientist to look specifically for arguments supporting this globalist agenda. They want their 100 trillion dollar international tax scam. But don't worry the largest bulk producers of co2 and real toxins are China and India and their factories can stay open because they are exempt from this scam. The real danger is our fish dying from toxins and over fishing. Our land and air being poisoned. but never mind that, we got a scam to operate. RT is going Looney toons. Sunspots, winds, clouds and the most important things running the everlasting climate change. CO2 is result of warming. Not the reason of warming.